When would AWS be compelling, despite the complexity? Scalability. This is pretty hard to question. AWS definitely scales. Cash flow: The On-Demand services are Pay-As-You-Go, so this clearly helps when cash is tight. Infrastructure costs/support: This needs to be validated. See the AWS Premium Support Pricing page for more information about the cost of platform support. Performance: I will be diving much deeper in to performance over the next week or two and will be analysing EC2 alongside laptops and desktops. For now I will say that it performs well, but it isn’t the best-performing solution that we reviewed. Subjectively I would say that I don’t think most developers would consider a large instance to be slow. Availability anywhere (with an outbound RDP connection): Obviously the down side here is that this connection isn’t always available or reliable everywhere, for instance on a train. Special scenarios: Some examples I can think of here would include testing for large farms and office moves. I shan’t delve in to the scenarios, but there are sure to be others. Cost: This needs to be validated, and I will share an example analysis below. This screen shot of an Amazon invoice (tidied up in Excel a bit) is the real invoice I received for my testing time. I’ve included it here because I think it illustrates the impact of instance usage time on total costs really well. It’s by far the largest cost at ~90% of the bill for this testing time, and that included a couple of weeks when I wasn’t using the instances. During that “down time” I was still billed for storage use and Elastic IP address disuse. Keep that in mind, as you will continue to accrue charges even if you shut down your machines. Gain an understanding of the impact of on-demand usage compared to reserved instance costs. Assess these costs relative to hardware costs over an average lifetime of three years. This analysis was only intended to indicate ballpark costs and some of the figures are nothing more than educated guesses, but I think they should serve their purpose as indications. This analysis didn’t factor in costs for Amazon’s Cloud Watch (monitoring and reporting), Amazon Support, licenses (other than Windows) and probably some other factors I overlooked, but I’m publishing it here as it might be useful for other high-level assessments. But obviously everyone should work this out for their own usage patterns and obviously, all price information is subject to change. 8 hours/day on-demand = $1950/instance over three years. 24 hours/day on-demand = $5295/instance over three years. Mixture of 50 reserved instances running 24 hours/day and 20 On-Demand Instances running 8 hours day = $3779/instance over three years. 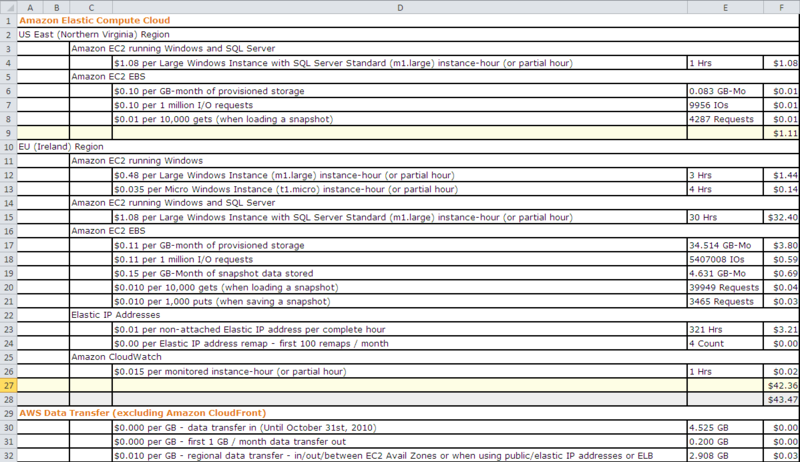 24 hours/day reserved instances = $4511/instance over three years. The difference in cost between on-demand usage 8 hours/day vs. 24 hours/day is enormous. Even the difference between 70 on-demand instances at an average of 8 hours/day compared to 70 reserved instances is huge: reserved instances are more than twice the cost. A mixture of reserved instances and on-demand usage probably won’t help enough to make it compelling. The only way that EC2 appears to be cost effective for large instances, used routinely, is to manage usage effectively. The detail for these calculations is provided below, with monthly costs. Those totals have been multiplied by 36 months and divided by 70 users for the cost summaries above. Reserved instances have an up-front cost of $910 per-instance per-year (or $1400 per-instance per-three-year-commitment) before usage charges are included (at a lower, reserved rate of $.24 per-instance per-hour). This means that reserved instances are a lot less viable for organisations looking to EC2 for cash flow benefits. The figures above were calculated using the $910 up-front cost, as I don’t believe most people will commit to three years of usage from the start. The reserved instance prices would clearly come down quite a bit with that three-year commitment, so feel free to recalculate as you like, but keep in mind that higher up-front cost is even worse for cash flow. *This total does not include any support costs and is based on un-validated assumptions. Mixture of 50 Reserved Instances and 20 On-Demand Instances. Amazon Web Services can be quite expensive if usage is not controlled effectively. Based on these calculation, I don’t feel that $1950/instance over three years is bad value. These environments perform well and provisioning is very quick. There are no underlying virtualisation support costs or power costs. The scalability is inherently appealing and the Pay-As-You-Go model might be compelling for some businesses or independent users, despite all other considerations. In our case, we dove deeper in to the productivity question, attempting to get a handle on how the performance of server-class hardware in the cloud stacks up relative to laptops and desktop workstations. We wanted to understand if the complexity, potential remote worker issues and cost might be justified based on productivity gains. Some of these findings were surprising, as I will reveal in my next series of posts on SharePoint development environment performance. Fantastic series of posts Tristan! I’ve created a post that includes my real-world usage and costs for November if you’re interested: http://brendannewell.com/musings/?p=140. Cheers Brendan! And thanks again for your help with all of it. Yeah, I checked your post yesterday. Many thanks for that. The costs look quite similar to the costs during the testing. One thing I noticed in November was that having five snapshots bumped the storage costs up quite a bit. But I suppose that’s entirely expected! What is the scenario you are considering that has the ratio of 1 user to 1 instance? Surely a single instance can accommodate multiple users? SharePoint development has lots of drawbacks with multiple users sharing the same environment, but actually, resource usage alone would probably preclude its effectiveness on an instance of the size we’re considering here. More thoughts on why shared development environments don’t work well for SharePoint over here http://tristanwatkins.com/index.php/sharepoint-development-productivity-and-virtualisation-technologies/ (see the “What about shared, hosted development environments?” section).